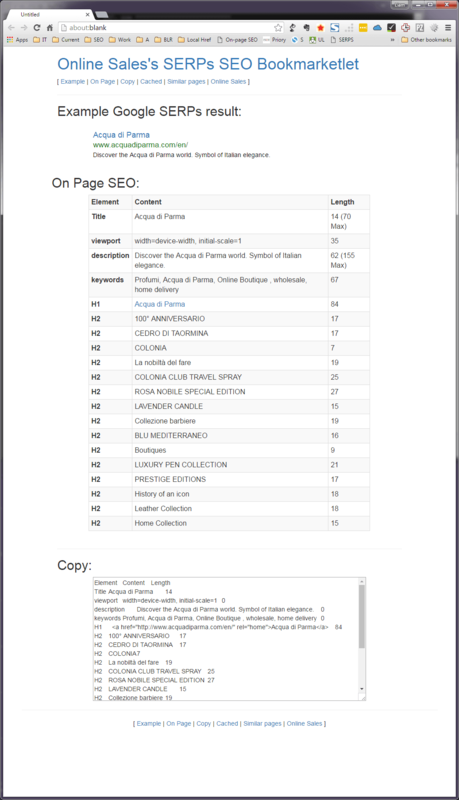 Over the years I’ve published many versions of the Serps Bookmarklet. Recently Google have changed their HTML of the results pages so I’ve updated the bookmarklet, and added a new feature. The SEO Bookmarklet has got a little long in the tooth, so I’ve updated it On-page SEO Bookmarklet. The output now uses the Bootstrap theme, and has a useful textarea to cut and paste the on-page results. 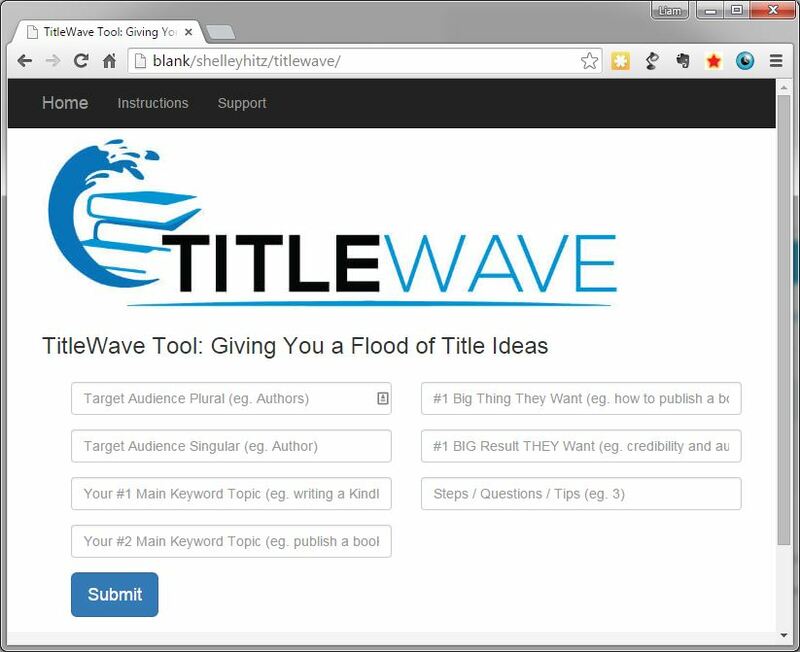 I recently had the great pleasure of working with Shelley Hitz of Author Audience Academy to create a book title idea generator called TitleWave. 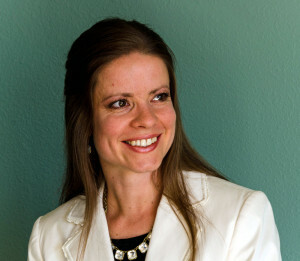 At her site, Shelley offers a training course and community site for inspiring authors to get their book written and published within 30 days. She had seen my previous Title Generator for TweakYourBiz. I’d based that upon my own Topical Brainstorm tool. 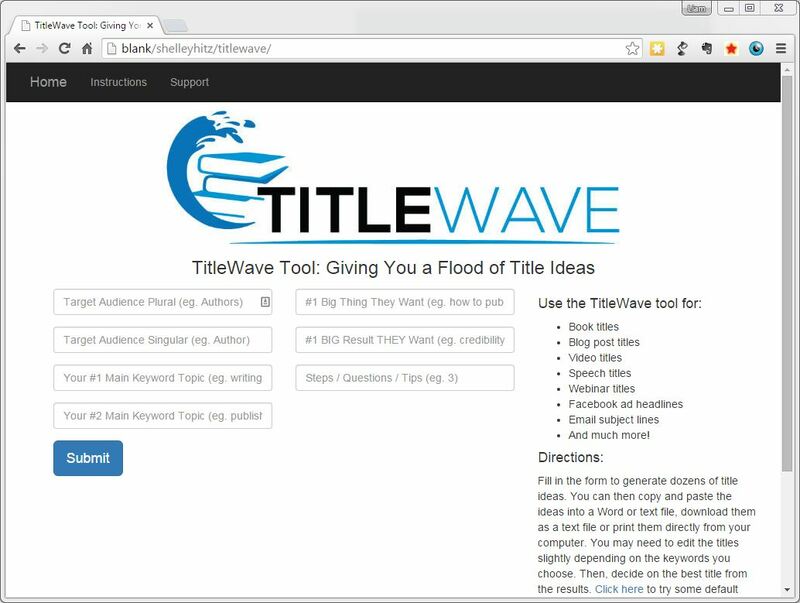 Shelley wanted a new web-app more focused for her audience that would generate book title ideas and such like based upon multiple inputs rather than just one keyword I’d done prevously. 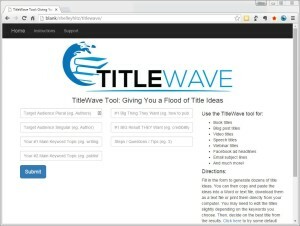 This would allow her to create more complex and richer titles and subtitles for her clients. We also needed the ability to upload new templates so she can continue to easily add seasonal ideas. We were also mindful of the needs of a modern audience so we developed the tool using the Bootstrap framework, this allowed us to create a tool that would work well on mobile and tablet in addition to the desktop. Shelley has published over 35 books using her ASCENT method, so if you’re an aspiring non-fiction author, head over to her site to see how she can help you publish your book. There have been similar applications before that got rid of the clutter and make the reading experience both more enjoyable and easier, now Evernote’s Clearly has been released for Chrome users. Over the many years I’ve been developing websites and working in Search Engine Optimisation I’ve developed a number of scripts, tools and bookmarklets. Pinboard I decided to release the Online Sales Webmaster Tools as monthly paid subscription. I’ve already got more than 50 tools and bookmarklets in the offering and I have many more to publish. The price increases with each new subscriber so it pays to get in early. These tools are forged in the “less is more” mold, so if you find you outgrow them and need more, consider the SEObook Community & Tools or Raven SEO. In the meantime, the Online Sales Tools will do pretty much all you need as a webmaster at a low monthly cost. Note that the annual fee is less than the cost it would take to pay a programmer to develop just one or two of these tools. StudioKraft Creative Web Services have updated their terrific tool that’s particularly suited to PPC and local SEO – Find Cities In Radius. This script will list cities within a certain radius from a starting zip or post code and works for the UK in addition to the US, Canada and Australia. Trim Google Search URL – Now with Added Hash! As more and more people are getting the hash variation of the Google results URL here’s another update to the original Bookmarklet To Trim Google Search URL to also handle the “#” variation of Google results. Posted in Tools1 Comment on Trim Google Search URL – Now with Added Hash! After I wrote the Google Results Bookmarklet some feedback form Marty Lamers led me to revise my previous Onpage Links Bookmarklet to also include the text boxes that make it easy to grab the links. I’ve updated the styling to highlight the nofollow links, and to “stripe” the output to make it easier to read. Once more drag the link in the big green box to your bookmark bar and when you’ve on a page you want to analyse hit the bookmarklet. It will open a new window showing all the links and with several text boxes with the links as detailed above. Update – The latest version (2018) is discussed here and the bookmarklet itself is https://www.onlinesales.co.uk/tools/tools/bookmarklet-serps.php. I used to have the code here for you to inspect and adapt, but several sites have stolen the code (which is naturally and automatically covered by copyright) and re-branded it as their own. :-(. Code and contents © Liam Delahunty, 2009 – 2019. Often when researching backlinks I’ll want to quickly see the onpage / outgoing links from a given page. This bookmarklet displays all the links from a page, gives their anchor text, and also the “rel” attribute for spotting nofollows etc. Feel free to add a comment below and if you find it useful then bookmark this on del.icio.us for your future reference.